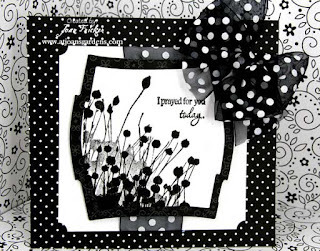 Black and white cards are some of my favorite and I knew when I ordered this stamp that I would love it. I stamped the image and then spent some time figuring out which Nestie I wanted to use to cut it out. I tried adding some red for accent , but it took away from the classy look of the black and white. I used the two largest Labels 2 Nesties to cut out the stamp and mat it in black. It needed some white contrast, so I cut white card stock slightly larger than the largest die and punched the corners with the SU ticket punch. A strip of sheer polka dot ribbon was ran on top and then underneath the card stock. I attached it in the back with my Glue Glider. I glued the polka dot DP to a 6.5x5.5 white card stock and all of the layers we glued together with my GG. Therm-O-Web Dimensionals popped up the layers for added interest. The sheer bow was added for more interest. It is hard to see all the loops in this photo, but IRL it is very pretty. I am a little late for Sharon's Friday Challenge, but I do believe this card is within her guidelines. Lovely creation, Joan, and you are NEVER too late. The challenges are open-ended. Thanks for playing. Joan this is a beautiful card. It is very classy. I always love the Penny Black images. Your card is beautiful Joan, a wonderful design. Wonderful card Joan. Always love the classic look of black and white. You have taken it one step up to fantastic!! Keep up the great ideas. Joan,your card is absolutely Beautiful!! I love the black and white together. It always looks so classy and elegant. Joan.... this card made me gasp! I love, love, love the black and white - those papers are to die for and that bow--- WOW! Tres classy! VERY classy card, Joan! You ROCK these beautiful designs! WOW! This is just stunning and just love this color combo ALOT!